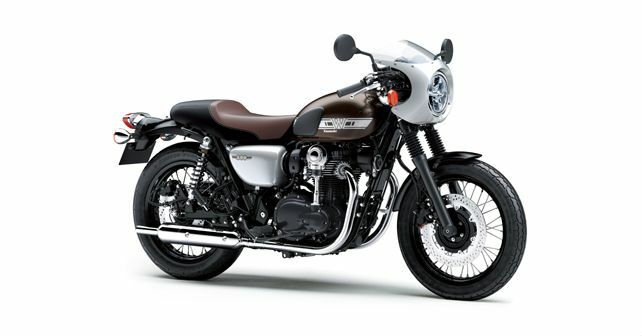 The 2019 version of the parallel-twin, retro-style star from Kawasaki has made its European debut at Motorcycle Live in Birmingham, United Kingdom. The bike made its appearance in 2011, as a replacement for the W650. However, as the motor did not meet the Euro4 emission norms, it was discontinued in 2016. Now, with a handful of additions and updates, its back in Street and Cafe Racer versions. The W800 is powered by a 773cc air-cooled, parallel-twin motor with a bevel-drive overhead camshaft setup. While the official figures will be revealed by Kawasaki sometime in early 2019, judging by the specs of the old model, power output is expected to be around 47bhp. The bevel drive setup uses a vertical shaft to operate the overhead camshaft. It's an expensive but an elegant answer to the reliability issues faced with regular cam drive. Before modern materials and design made cam chains and tensioners super-reliable, a bevel shaft drive was an effective, high-quality solution and was used by Ducati, amongst others. The W800 uses a double-cradle steel frame, which is reminiscent of the old W1, but it has been precision-forged to maintain good rigidity for an overall stable and well-balanced ride. The frame is complemented by a 41mm telescopic fork and dual shocks. While the 18-inch spoke wheels maintain the bike's retro appeal. The brake setup has received a modern makeover, which comprises a 320mm front disc and 270mm rear disc, with ABS as standard. While there is no official date of its launch, the W800 is expected to go on sale in the European and American markets sometime in early 2019.